Endeavour Energy is being sued over damage to homes and property in a Blue Mountains bushfire in 2013. The court has heard that Endeavour knew there was a risk, and even told customers to trim their trees, before cables running through branches were found to have sparked the inferno. 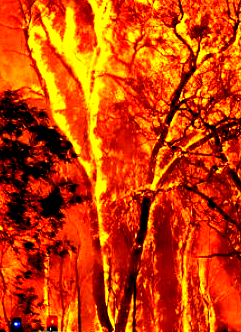 The company warned of the danger posed by one particular tree in 2012, residents say, and it was the same tree that allegedly saw the first sparks of what later became a bushfire, which destroyed 200 houses in the area. In its class action, law firm Maddens Lawyers is arguing that the tree had been identified as a hazard in July, evidenced by the repeated letters, but claims nothing else was done to fix the problem in subsequent months. They say that the state-owned Endeavour Energy had an obligation to ensure the notice was carried-out. A spokesperson for Endeavour Energy has said it fully supports the investigation. “Endeavour Energy understands the devastating impact the 2013 bushfires had on the Blue Mountains community,” an official statement reads. Lawyers will ask the NSW Supreme Court for internal documents relating to the tree and its dangers in court this week.